Manage your customers and staff anytime, anywhere, all from one place! Our Work Order Software (CMMS/Field Service Management Software) helps manage your business, not just work orders - saving you time and money. With our application, contacts from your website are automatically converted to work orders. 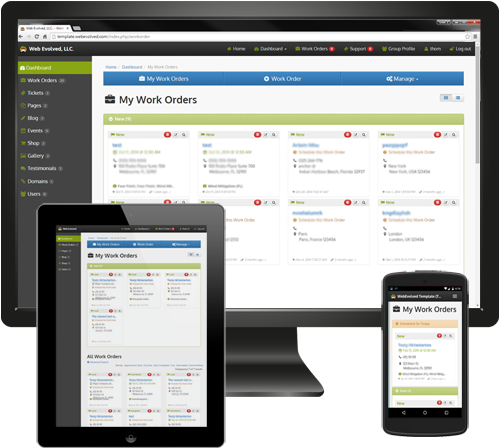 In simplest terms, this is an online work order & team management application, often called Work Order Software, CMMS and Field Service Management Software. What makes our software different is that it runs on the backend of your website. So, when a customer submits a quote or service request on your website, a work order is added as a lead to the website. When you login, you will be able to manage this lead, assign staff and attach notes, documents, images and reports to specific work orders. Maximize efficiency with automatic notifications/emails and invoicing. This application also eliminates the need for paper, saving your business money on not only time, but also paper and ink costs. First, we build you a brand new, responsive website that works on all devices. Your new website comes with Search Engine Optimization, guaranteeing a top spot on Google. Then we create pages for your business on Facebook, Twitter and Google+, with a listing on Google Maps. Then we set up a meeting to determine the best way to set up the system for your business; this includes setting up the automatic emails and notifications, work order statuses, user groups, and more.